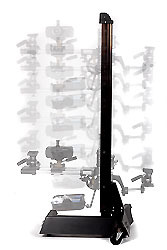 Giclee Media Supplies::Image Capture::Art Repro::Studio Stand (vertical, large) Heavy Duty Micro Adjustable. Studio Stand (vertical, large) Heavy Duty Micro Adjustable. and go foot powered operation.